The Kellogg School's full-time Class of 2009 consists of 34 percent women, 22 percent minorities and 34 percent who are non-U.S. citizens. 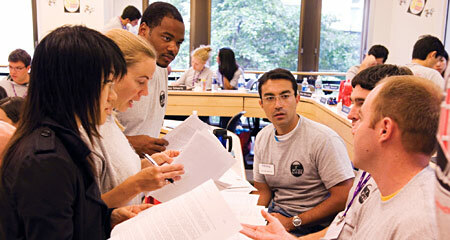 Incoming students represent 48 different countries including the United States. On average, they are 28 years old and share more than 3,000 years of collective work experience. This class is as engaged as it is eclectic. Among their many accomplishments, class members have co-founded a nonprofit that helps grant the wishes of dying children, completed two tours of duty in Iraq and received two gold stars, published a book, worked at the U.S. Embassy in Paris, launched Apple Online in Korea, worked for the NASA Human Spaceflight program and volunteered with the Peace Corps in Romania. There were 4,188 applications for the Full-Time MBA Program this past year, resulting in an incoming class of 614 students. The mean GMAT score of the entering class is 704 and the median is 710. Students in the class hail from around the globe, including 17 percent from Asia; 1 percent from Eastern and Central Europe and Central Asia; 3 percent from Western Europe; 5 percent from Latin America and the Caribbean; 1 percent from Africa; 1 percent from the Middle East 70 percent from North America.